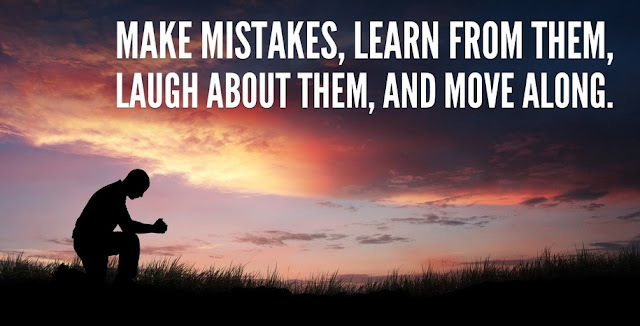 Make mistakes, learn from them, laugh about them, and move along. Do you like making mistakes? I certainly don't. Making mistakes is inevitable. Wouldn't it be wonderful if we could be at ease with them? Perhaps there is a way to think of them differently and see their benefits. Think in evolutional rather than fixed terms.When we accept change as the natural structure of the world, our vulnerability and humanness lets us work with the ebb and flow of life. It also helps to keep in mind that trial and error is an organic natural way of living. It is how we have evolved over time. It is better to be with our natural evolution than to fight it and make life harder. Mistakes are part of the trial and error, experimental nature of life. The more you adopt the experimental, evolutional frame, the easier it becomes to handle mistakes. Handling mistakes well can help you relax and enjoy all aspects of life more. FREE Subscription - Click here to get articles like ' Reframe Reality To Handle Mistakes More Easily ' in your Email.